We are offering 2 original Uniform Buttons from the Transcontinental Air Transport Company (later became TWA) from 1928. This design is very similar to the Army Air Logo except their propeller is vertical. These buttons are about the size of a quarter. Transcontinental Air Transport was incorporated in 1928. The Transcontinental Air Transport-Maddux Air Lines (TAT) was formed from merger of Curtiss Aeroplane & Motor Co, National Air Transport, Pennsylvania Railroad, Wright Aero Corp, and St Louis businessmen. In 1929, the company merged with Western Air Express as Transcontinental & Western Air and became TWA. 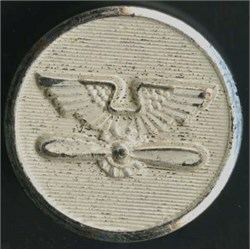 Superior Quality was a name used by the Waterbury Button Company, between 1875-1935 and the Steele & Johnson company who were acquired by the Waterbury Company.